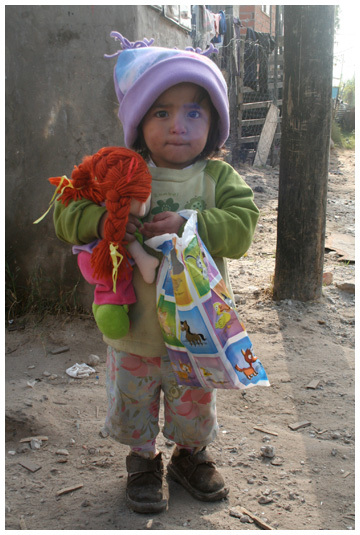 Todos Juntos assists children and their families, improving their daily living conditions, basic needs and access to basic services within the slum communities of Buenos Aires. Todos Juntos is a non profit organization registered in Argentina and the United Kingdom. Founded in early 2005 to act within the slum communities of Buenos Aires, Todos Juntos assists children and their families, improving their daily living conditions, basic needs and access to basic services. An estimated 41 per cent of the total population of Argentina live below the poverty line. In Buenos Aires alone almost one third of the population are considered to live in poverty and 14 per cent in extreme poverty. Known locally as the “villas miserias” or misery towns the sprawling slums of Buenos Aires are home to thousands of impoverished families living in extremely precarious conditions in makeshift homes often without proper sanitation, electricity or running water. Within these growing squatter communities there often exists a climate of misery, lawlessness and criminality and children growing up in these neighbourhoods are exposed daily to drugs, violence, alcohol, crime and hunger.